Lewis Carroll's 1865 novel, Alice's Adventures in Wonderland, contains a chapter entitled 'A Mad Tea Party', which describes a collection of strange characters, single mindedly focused on one thing, and almost entirely oblivious to the real world outside of their nonsensical party. This tea party was hosted by The Hatter, sporting his top hat with the price, 10/6, still attached. None of the characters in the book referred to The Hatter as mad although the trait is inferred. Most hatters in Carroll's time became mad due to the mercury vapors used in their work. The March Hare, another guest at the table, was also never directly described as mad. His limited sanity is implied by his actions and from the popular phrase 'as mad as a March hare'. They Hatter and Hare are accompanied by a very sleepy dormouse who occasionally rises from his slumber to state the obvious. 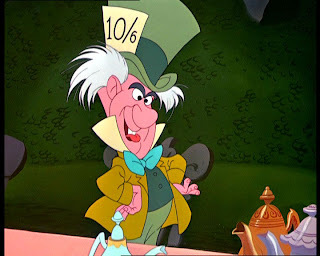 Amidst the festivities the Hatter poses a riddle to Alice, "Why is a raven like a writing desk?" When Alice cannot answer, the Hatter admits that he also has no answer. Lewis Carroll a.k.a. Charles Lutwidge Dodgson was known to write astute political commentary which he disguised as seemingly innocuous tales. Can we now add prophetic to his list of talents?